On today’s show, due to a serious lack of time, I ask my listeners to forgive me for repeating a past show. I’ll be at the Texas Bitcoin Conference in Austin this weekend and will be back next week with a slammin show that is sure to make you stand up and shout Yee Haa!!!! On today's show I travel to San Diego to speak with Paul Puey, the CEO and co-founder of Airbitz.co, a mobile and web app company soon to be launching a Bitcoin wallet on iOS and Android. Airbitz is also a business directory that helps you find merchants in 14 different countries where bitcoin is accepted. Paul talks to us about the launch of their bitcoin wallet in a few weeks and how the Airbitz wallet differs fundamentally from many other bitcoin wallets. I also speak with Sam Patterson, the Operations Lead for OpenBazaar.org. Open Bazaar is an open source project to create a decentralized network for commerce online using Bitcoin that has NO fees and cannot be censored. Sam talks to us about Multisig addresses, notaries, arbiters and how the peer to peer transactions and open source code of OpenBazaar is going to change how we buy and sell on the internet. In this interview we will find out if it's possible for a notary and arbitration network to actually replace Trust! 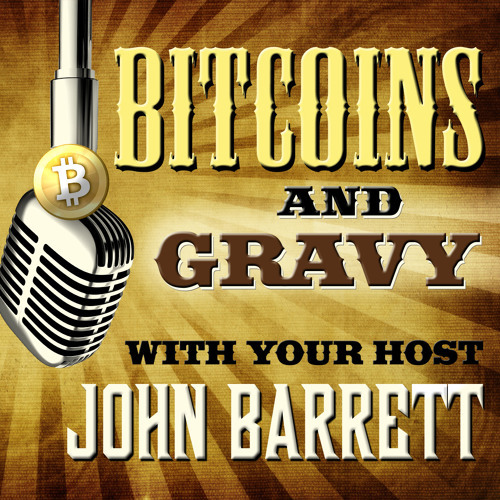 Magic Word Hidden in each episode of Bitcoins and Gravy is a Magic Word. I know that it may sound absurd, but listen for the Magic Word and you can earn LTBcoin! First set up a free account at LetsTalkBitcoin.com. Then tune in to your favorite LTB podcast and when you hear the Magic Word, don’t delay! Submit it to your account and by doing so you will earn a portion of the week’s LTBcoin distribution. Setting up an LTB account has always been fast and easy . . . and now it’s profitable!!! CREDITS: Airbitz.co Google Play store Apple app store OpenBazaar.org Open Bazaar song lyrics and melody by John and Robert Barrett Ode To Satoshi Ode to Satoshi lyrics & melody by John Barrett Copyright 2014 RJM Publishing - BMI Nashville. Lead Vocal, Harmony Vocals, Harmonica, Snare Drum: John Barrett Harmony vocals: John Barrett, Connie Sinclair and Lij Shaw Guitar: Jonathan Brown Mandolin: Ben Miller Bass Guitar: Michael Rinne Initial tracks recorded by Mark Thornton of Sidekick Sound Studios, Madison, TN. All other tracks Recorded, Mixed and Mastered at The Toy Box Studio, Nashville, Tennessee Engineer: Lij Shaw. Assistant to engineer: Don “The Don” Bates Produced by John Barrett & Elijah “Lij” Shaw Special thanks to Alan Baird for his dobro, guitar and mandolin playing on many of the shows. Now that’s some pickin man! Thanks also to Alex Munoz Guijarro for his excellent pedal steel playing on many of our shows. Interviews for this episode were recorded and edited by John Barrett at The Tree House Studio - Nashville, Tennessee. All shows are produced by John Barrett with the moral support of his trusty sidekick Maxwell Rascalnikov CoyoTe Rex, aka Max. Theme song “Gravy” by the band, Eleanor Roosevelt with Elijah “Lij” Shaw on fiddle. And a big thank you for moral support from my good friends at The Tennessee Bitcoin Alliance: TennesseeBitcoin.org Professional transcriptions are provided each week by one of our fans who can be found at: http://diaryofafreelancetranscriptionist.com/2015/01/21/free-transcript-project-8/ And of course you can find a link to this website in the weekly show notes. Questions or Comments? Email me to say Howdy! : howdy@bitcoinsandgravy.com Visit theWebsite: BitcoinsAndGravy.com Bitcoins and Gravy Tipping Addresses: Bitcoin: 1ByqQXLTm9JZGSwnfqCCakaifBt3grQkXS Litecoin: LgqYgxLTBPgr8C1JGLLJVLK4ZN1fveprAp And if you don’t feel like contacting me, just kick back, relax and enjoy the show. I hope you enjoy listening to my guests as much as I enjoy talking with them!